As promised, here's a few photos of the tile installation. They funny thing about it, is that the amount of work to get to this point was quite considerable! Since I was putting in a tile floor, the sub-floor needed to be very stiff so that it wouldn't flex and pop the tiles. The larger the tile, the more important this is. My tiles were ten inches square so they were definitely big enough to be concerned about it. So what did I do for prepwork? First, I had removed the old oak strip flooring to get to the sub-floor. Once I could visually see it, I made sure it was structurally sound and didn't have any rot or other problems. 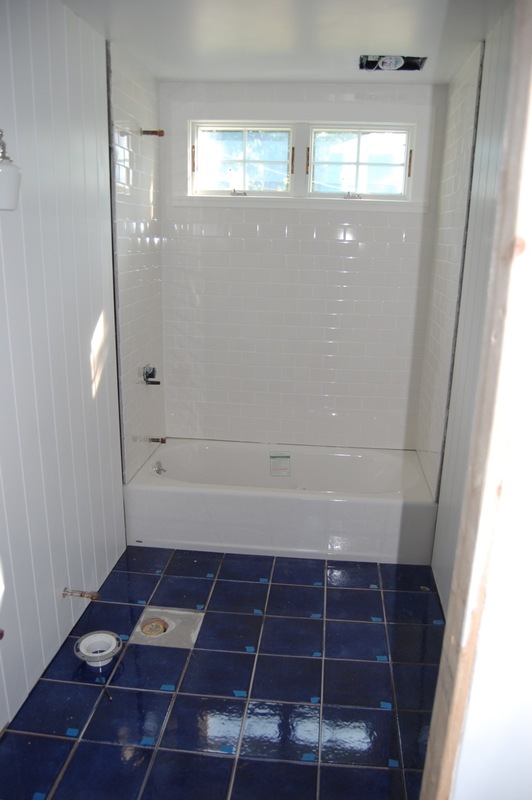 This bathroom is on the first floor and above a crawlspace so I ended up doing some crawling too. I went in the crawlspace and inspected the joists. They were spanning the entire distance and were two by eights (2x8). That spanning distance for that dimension lumber was at the near maximum allowed so I had to fix that. I ended up getting three two by twelves (2x12) that were sixteen feet long and glued and bolted them together to make a single large beam. This beam was set in the middle of the joist run to reduce the span load and strengthen the floor. This was one of the 6 ways to stiffen a bouncy floor as detailed in the Fine Homebuilding magazine. I used custom made Simpson Strong-Tie joist hangers to attach it. With that out of the way, I laid down some Durrock using thinset and screws to attach it. Next, I laid out all the tiles and looked to see how they looked. Since the Italian tiles are hand-made, the color glaze is slightly different for each one and I wanted to make sure it looked pleasing to the eye. I numbered each tile with a piece of painters tape before I pulled them all back up. I didn't want to lay them back down in the wrong order, since I spent some time rearranging them. I put down the thinset for the tiles and quickly got them all put into place. I left off the few I needed to cut for the toilet and pipes. I used a piece of cardboard and made a template for the hole in the last tile so I could accurately measure it when I was in the shop cutting it. 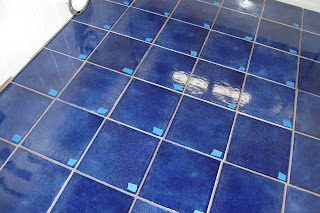 The tiles were thick so cutting it took quite a while - and expensive enough I didn't want to break it! Luckily, when I had measured out the bathroom, I had the perfect dimensions so that I didn't need to cut any of the side wall or end wall tiles! That definitely sped up the tile installation! I let the thinset dry for a few days before I came back and put down the grout. As you can see in the picture above, I had the tile for the toilet cut because I really wanted that in place before doing the grouting. I had a couple more holes to cut for the water supply lie for the toilet and the radiator on the opposite wall. I used a tile / stone diamond hole saw to make those holes. I actually ended up replacing one of the tiles because the plumber had tried to cut the hole with a plain hole saw and ended up cracking the tile. After telling me the tile was too strong and it couldn't be cut without making bigger holes, I proceeded to do it properly and told him to let me know if there's any other holes to be made - as I didn't want to replace any more tiles that he would break. I think the final result came out excellent. 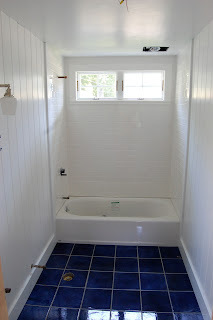 Tile work isn't too hard, but you need to be patient and don't mind working on your knees!